What is the theory of intelligent design (ID), and what do you think of it? It probably depends on which of two general categories you fit in. There are those who think intelligent design is, or at least may be, a valid research program. Even the less enthusiastic among this group say, ID the way its defenders describe it might be interesting to explore and consider. Then there are those who are convinced ID could never have anything worthwhile to offer, and whose message is, ID the way I describe it is stupid, and never mind how the ID folks describe it. Lawrence Krauss, a firmly committed atheist and opponent of ID. He’s a highly recognized theoretical physicist and cosmologist at Arizona State University, who believes life and the universe came about by unguided natural processes. Denis Lamoureux, an evangelical Christian, who holds to the same general belief about life’s origin and development but puts it in a theistic evolutionary framework. Lamoureux holds three earned PhDs, one of them in evolutionary biology, and teaches at the University of Alberta. Stephen Meyer, a theist and also an evangelical Christian, representing the ID position that both life’s origin and its development can best be explained by reference to a guiding mind. Meyer is a former geologist who went on to earn a PhD in the history and philosophy of science from the University of Cambridge and has written two bestselling books on ID: Signature in the Cell: DNA and the Evidence for Intelligent Design and Darwin’s Doubt: The Explosive Origin of Animal Life and the Case for Intelligent Design. The interchange between Meyer and Krauss ended up being the main point of interest. In his opening statement Meyer defined ID as the idea that certain features of the natural world are better explained as the product of a guiding transcendent intelligence than as the result of unguided natural processes. By way of example he showed that new functional protein configurations, which Darwinian evolution must discover by chance, actually cannot be discovered that way. Not only that, but these proteins possess new and functional information — the sort of thing that in other contexts we always ascribe to intelligent causes. Therefore it’s reasonable to conclude that this biological information (and other information-rich features of life) also was the result of an intelligent design. That’s ID in the briefest possible nutshell. You may have heard it described differently. Maybe you’ve heard of it as the silliness that “some things are too complicated to understand, therefore God did it” (or as some mockingly put it, “Goddidit”). Or you might have heard that it’s all about the “God of the Gaps” — that there are gaps in what we understand about nature, and ID wants to rush God in to plug those gaps, when instead we ought to just let science do the job. Neither of those would qualify as good thinking, but neither of them is what ID argues, and neither describes what Meyer put forward. But Krauss, eager to do battle with a straw man (more on this below), insisted that was what ID was about, and ridiculed Meyer (and all of ID) for it. Krauss made the same kind of mistake repeatedly. For example, after Meyer made the point — absolutely uncontroversial among mainstream biologists — that some of evolution’s processes must be random, Krauss ridiculed him for claiming that everything in evolution is random. It’s an easy claim to ridicule, except that (as he underscored in a later blog post) Meyer doesn’t believe the claim and never said it. Throughout much of the debate Krauss was committing what philosophers and debaters call the “strawman fallacy.” It amounts to erecting a false version of another person’s position — one that’s easy to knock down, like a “straw man” — and then knocking it down and declaring victory. It pretends to refute the other person’s position when really it doesn’t even address it, but something else instead. Krauss didn’t limit himself to intelligent design straw men. He ranged as far as presenting straw man versions of God, the Bible and Christian theology. And he didn’t just do it in response to Meyer: he dove right in to ridiculing strawman versions of ID and Christianity in the first few minutes of his opening presentation, which came first in the debate. It’s clear what Krauss thinks of God. It’s clear what he thinks about what he says Meyer and ID say. It’s not clear what he thinks about the actual theory of intelligent design, only that he seems not to want to think about it, at least not publicly since he is clearly intent on changing the subject in order to do battle with straw men instead. The real deal is much harder to dismiss. Maybe that’s why people like Krauss appear intent on avoiding it at all cost. I must confess I did not watch this debate. It was mainly because I have seen Krauss debate educated Christians before, so I knew pretty much what to expect. And the reviews I have read, have confirmed to me that it would have been a waste of my time—not to mention a number of other things. However, I can say this much. Science is a quest for the truth. Any quest for the truth must begin with some personal humility and honesty as well as a deep respect for your fellow man—especially when dealing with those who have done research and study outside your field of expertise. Krauss seems to fail at all of the former. Were there any surprises this time? Or was Krauss as arrogant and incorrigible as he has always been? 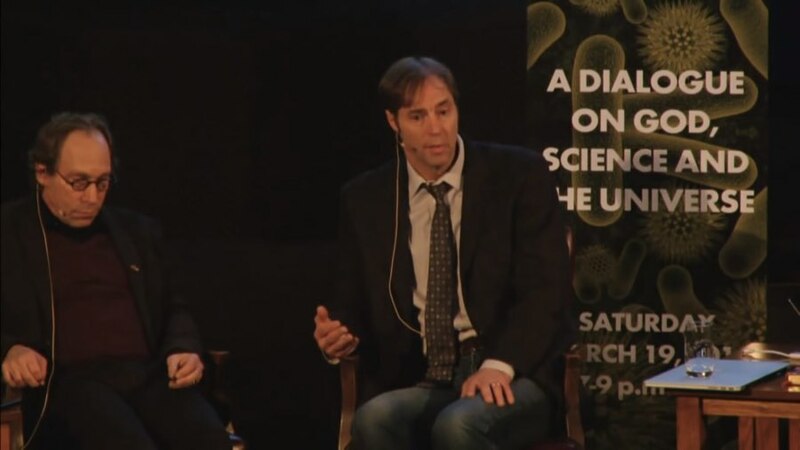 In the instant debate – no surprises – Krauss was the same churlish boor, with added offensive and disgusting incivility. I stopped watching these debates when the same thing happened to Dr Hugh Ross. Atheists are concerned with truth, they’re pursuing something that blocks God and they must destroy every link to him to create their insupportable world. It’s really just the moving target fallacy in other drapings. “are concerned with truth” or “aren’t concerned with truth”? And yet, those who promote the “science” of ID won’t name the intelligence. How disingenuous. At least Wayne here had the stones to cite God. As your God is, by definition, supernatural, why do you have such an issue with people who leave the supernatural out of the equation? If your supernatural deity really does have an invisible hand in the world, present the evidence! Describe how a supernatural being interacts with the natural world, then design experiments to prove it. All this moaning and handwaving just proves how weak your faith is. ‘disingenuous?’ In the application of scientific methods and techniques to the investigation of crime – forensic investigation – the investigator is sometimes asked to determine if there is evidence of foul play / murder or suicide with no requirement to name the culprit if evidence of murder is found. Always. There is no alternative explanation. Crime and coding analogies assume human actors, even if an individual is not named. ID doesn’t identify the actor in any way. However, humans designed dogs, although not all the designs are intelligent. “Humans designed dogs,” crime & coding. Now, does that mean that Humans designed computer code & DNA code ‘although not all the designs are intelligent? Meaning, a designer, just not an ‘intelligent’ designer? Thank you for identifying the designer / actor – “humans” did it. Who was it who said, “Biology is the study of complicated things that have the appearance of having been designed with a purpose…”? DaveG, you are perpetuating another straw man. ID proponents have named some possible ID agents, including Panspermia, terraforming of Earth by advanced alien civilizations, past visits to Earth from advanced aliens, time-travelers from the future, and higher-dimensional beings (including God). Some microbiologists have suggested possible swarm intelligence from bacterial colonies, or internal genetic engineering from complex cellular network intelligence. Discussion on ID sources is limited, however, because there isn’t enough information at the moment to develop detailed theories on them. Personally, I don’t perceive or promote ID as science. (Though it doesn’t really bother me if others, like Meyers, do.) For me ID is the philosophical/ theological analysis and interpretation of certain kinds of scientific evidence—from the cosmological to the microscopic, atomic and sub-atomic. That analysis lead me to believe that an eternally existing transcendent mind (God) is the best explanation the existence of the world and why it exhibits an appearance of design. ID doesn’t have to name the cause of life, just that random chemistry cannot be the complete cause and some intelligent cause is needed, choose one for yourself. I chose Jesus because I know he is alive and the Bible says he created everything, Do your own investigation for a possible intelligent cause, because random chemicals cannot be the full cause of life, ID shows that for certain.